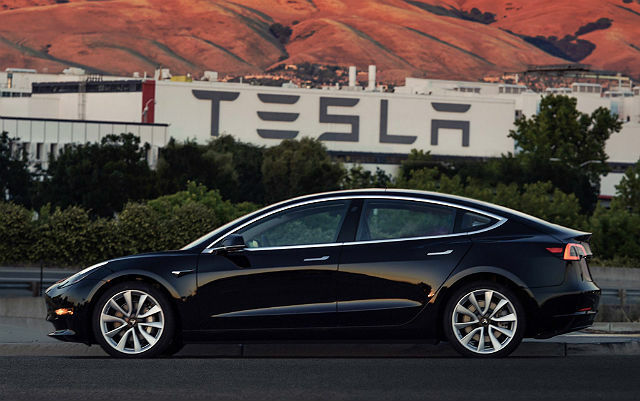 This past weekend, Elon Musk shared the first images of a production Tesla Model 3—the much-anticipated new electric vehicle that had hundreds of thousands of people lining up last year to place preorders. It was the latest in a series of major recent announcements about the future of the automotive industry. Earlier this month, Volvo Cars announced all of its new models will be electric or hybrid by 2019. Meanwhile, France announced it intends to end sales of gasoline and diesel cars by 2040, which follows similar goals in Norway (2025) and India (2030). Next month, General Motors may grab the headlines as its Chevy Bolt is expected to roll out nationwide. All the attention on electric vehicles raises the question: Is this the path to sustainable mobility? Yes: Electric vehicles can be a cleaner alternative to conventional vehicles. We are paying a heavy toll for our reliance on conventional vehicles. Health care costs, lost productivity and other consequences of road pollution amounted to $3 trillion in lost GDP collectively among OECD countries, China, and India in 2010. Electric vehicles offer a cleaner alternative, especially as more renewable energy is incorporated into the power grid. A recent study, factoring in emissions from the generation of electricity, shows the average battery electric vehicle in the United States today emits 214g of carbon dioxide per mile—far less than the 356g to 409g of carbon dioxide per mile produced by conventional gasoline vehicles. Yes: A lot of people want to buy them. What is perhaps most exciting about the Model 3 is the unprecedented demand. Never before has an electric vehicle—or any vehicle—had nearly half-a-million preorders a year before production. Electric cars officially have mass-market appeal. As a result, Bloomberg New Energy Finance is now projecting electric vehicles will account for more than half of new car sales by 2040 as demand increases and battery costs decline. Electric vehicle market penetration is critical to efforts to address climate change. New electric cars will need to be more attractive, affordable, and accessible to consumers who are driving today, as well as billions of people reaching middle income around the world who will be driving tomorrow. To reduce greenhouse gas emissions, electric car sales will need to go from zero to 60 in a hurry. 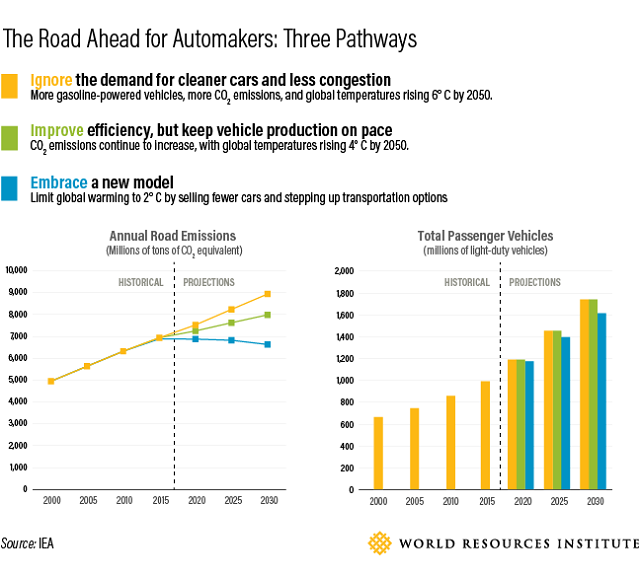 Scenarios from the International Energy Agency suggest that to keep pace with a pathway to limit global warming to 2 degrees C (3.6 degrees F), we need the global stock of electric cars to increase from 1 million in 2015 to more than 20 million in 2020 and more than 150 million in 2030. No: Electric vehicles are not, by themselves, going to get us to sustainable mobility. Anyone banking on selling millions more electric vehicles is ignoring the elephant in the room—and the billions of vehicles already on the road. Estimates of the annual cost of congestion in the United States, for example, exceed $100 billion. If the total number of cars continues to climb at its projected pace, we will not have a chance of limiting global warming, even if many of those cars are electric. Neither will selling cleaner cars solve the challenges of congestion, road safety, equal access to opportunity, or other mobility issues. This is why WRI and others champion the Avoid-Shift-Improve framework (see below), which emphasizes the types of investments that ultimately will allow people to move around in sustainable ways. So Which Car Companies Will Embrace New Approaches for Tomorrow’s Markets? Some will ignore the signals of market transformation. Investors are already looking to assess the leaders and laggards and better understand who is positioned to win or lose. Some will improve on existing options and make incremental progress. They may sell cleaner, more efficient vehicles, but that by itself is not enough to solve congestion or climate change. Some will embrace new business models and mobility services. We need more companies investing in the systems and services that meet customers’ mobility needs without putting more and more cars on the road. Bill Ford knows this. As he said in 2011:For most of [my 30 years at Ford Motor Company], I worried about how am I going to sell more cars and trucks. But today I worry about, what if all we do is sell more cars and trucks? What happens when the number of cars on the road doubles, triples or even quadruples?This seems to be part of the reason Ford made a leadership change this yearand is making investments in ride sharing and even bike sharing. All these developments and recent announcements are welcome. But more is needed—quickly. It’s a race worth watching. Who will be the first to grow their business without simply selling more cars to more people? The first aspect of sustainable mobility involves investments in options that allow people to avoid unnecessary trips, like walkable, mixed-use neighborhoods and options for telecommuting from home and shared-work spaces. These strategies can also include Transport Demand Management solutions like congestion charging, which can disincentivize people from driving in crowded areas at busy times, thereby reducing unnecessary congestion. The second aspect encourages investment in infrastructure that allows people to shift to other transport options that are better suited to move people around the cities of tomorrow, like walking, biking and public transit. Research shows that connected cities that have strong public transit systems and safe infrastructure for cycling and walking boost GDP, create new jobs and create considerable cost savings. Combining solutions from each of these two aspects with the third—improvement of transportation technology like electric vehicles—is the only sure-fire way create safer, cleaner, more convenient, affordable and sustainable transportation. We already know that cities around the world are growing at unprecedented rates and those urban residents are going to have more money to invest in their transportation needs. The ASI Framework can be a guide to disrupting the current transport industry and ensuring that these growing communities reflect our vision of a more sustainable, equitable future. Companies that want to embrace a new approach for tomorrow’s markets can find ways to advance the ASI Framework and move beyond outdated models of selling more cars to more people. Eliot Metzger is a Senior Associate in WRI’s Markets & Enterprise Program. Alyssa Fischer is the Strategy and Management Associate for WRI Ross Center for Sustainable Cities.